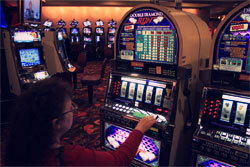 It is known that slot machines are the favorite diversion of many people. This machine appeared in 19 century in San Francisco. Firstly it was designed by Charles Fey. The name of the first 3 reel slot machine was The Liberty Bell. The slot machines of that time had three spinning reels with various interesting symbols pasted on the wheels. The work of slot machines has changed fundamentally since The Liberty Bell. With the modernization of the world, slot machines and their mechanism changed too. The main device which controls slot machine is Random Number Generator. The RNG is a brain of any slot machine. This generator is able to work up million numbers per second. So, let's find out more facts about the three reels slot machines. In such machines the RNG chooses 3 numbers at haphazard manner.. The computer in the slot machine is calculating all the numbers even when the machine is not used. . In the long run the computer is checking the virtual spin and identifying the winner. When you place the coin in the slot machine you should pull the handle. The symbols which appear in front of the player on the screen are reflected by the random number generator. If you make the correct set of numbers you are the lucky man, my congratulations you win a great jackpot! If you make invalid collection of the numbers then you lose, but you have a possibility to spin one more time. The slot machines are divided in 2 and 3 Class machines. The Slot Machine Class 2 connects to the central computer and imitates the result of the lottery ticket. Class 2 machines have equal chances of the victory. Class 3 machines is not connected to the main computer, they work independently. Such machines are popular in Atlantic City and Nevada sometimes they are called Vegas Style Slots.